Our friend Erin promptly scheduled in a second Ottolenghi potluck one month after the first. I spent that month utterly occupied by my job, working through all three weekends, and by the time the potluck rolled around I was keen to break out and contribute one of the Plenty More desserts. Predictably, it was the icecream recipe that took my fancy. Ottolenghi's halva icecream is rich with cream and egg yolks, with only a hint of sugar and tahini in the custard. It's fudgy chunks of halva folded through that provide most of the bitter-edged sweetness. The chocolate halva I bought from a local deli was crumbly and breaking it down into the directed half-centimetre cubes wasn't possible - I liked the texture it asserted in bigger blocks anyway. Ottolenghi elevates the icecream to full-blown sundae with brandy-spiked ganache, peanuts and black sesame seeds. It's the best kind of over-the-top - alternate spoonfuls of smooth chocolate with salted crunchy peanut, rich custard or a stealthy chunk of halva elicited the odd uh!, ohhh and mmmm around the table. The quantities below made little more than a half-litre of icecream - enough for a small scoop each - but double the chocolate sauce we could reasonably pour over it. It's no longer my habit to make recipes so heavy with cream and eggs, and I'd be inclined to roll this one back if I made it again - I know a great vegan ganache recipe, and I reckon the icecream could bear a nut-and-coconut milk adaptation. Place the cream and milk in a small saucepan. Slice the vanilla pod lengthways and scrape the seeds into the saucepan; place the pods in the saucepan too. Heat everything in the saucepan until it's just starting to boil, then take it off the heat. In a small bowl, beat together the egg yolks and the sugar. Whisk a little of the hot cream mixture into the eggs, then a little more, and then finally pour the egg mixture into the saucepan and return it all to a medium heat. Continue to stir and cook the custard until it's thickened slightly. Take it off the heat and whisk in the tahini until it's a smooth as you can manage - I found some little oil flecks in mine that just wouldn't go away. Refrigerate the custard until it's completely chilled, preferably overnight. Strain the vanilla pods out of the custard and reserve them for other uses. Pour the custard into an icecream maker and churn it according to the manufacturer's instructions. 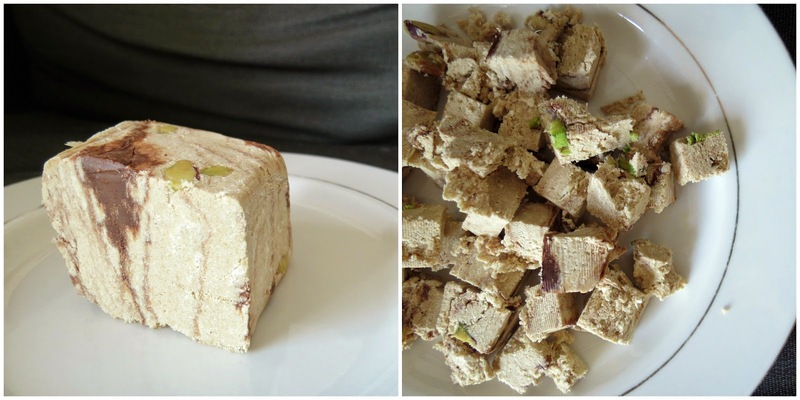 Gently fold in the chopped halva and freeze the icecream in a plastic container. Take the icecream out of the freezer to soften 10-15 minutes before you plan to serve it. Make the chocolate sauce by bringing the cream to a gentle boil in a small saucepan. Turn off the heat and whisk in the chocolate chips and the brandy. Construct the sundaes by serving modest icecream scoops, topped with chocolate sauce then sprinkled with peanuts and sesame seeds.